It’s been a long time coming for AMD’s FX CPU and as we close in on the rumored launch the mood seems to be somewhere between, “How can it be worse than the 1100T X6?” and, “is this worse than the Phenom launch?” For now it’s hard to say, but the leaked benchmarks are not very promising. Despite these ominous signs it’s still been one wild ride get to this point and on that note let’s take a look back at the long road to FX. Since AMD announced “Zambezi’s” launch date to be Q2 of 2011 there have been two main categories of news about the chip: official PR from AMD, and leaks. Boy have their been a lot of leaks. There’s been a steady stream of news about Bulldozer since the beginning of the year, and that’s unsurprising considering the expectation many have for the chip. Something tells me that there’s a striking correlation between the beginning of the Bulldozer news build up and the availability of Bulldozer samples to AMD’s partners. 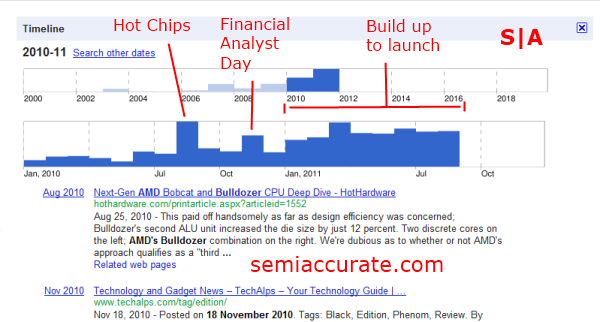 Bulldozer, in it’s current form, first showed up in AMD’s roadmaps back in 2008 shortly after AMD’s former CEO, Dirk Meyer, first took office. 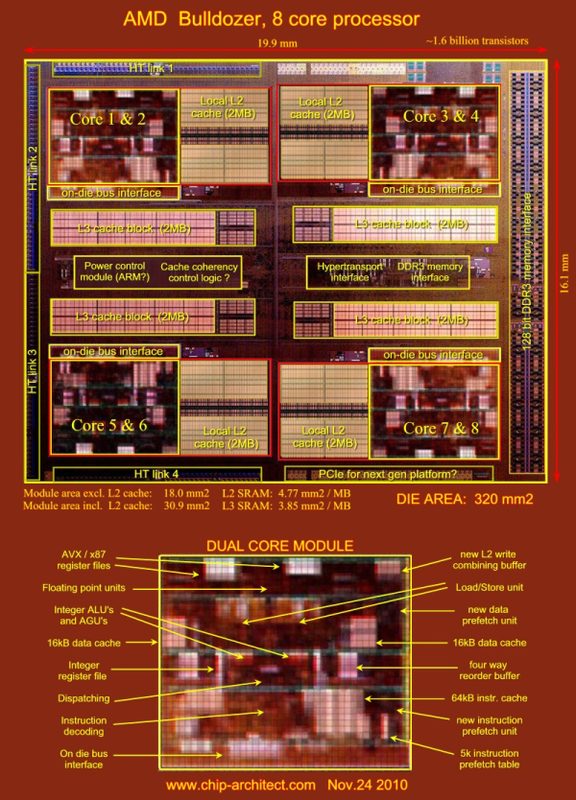 It was announced to be a 32nm part code-named Orochi and was slated for 2011. 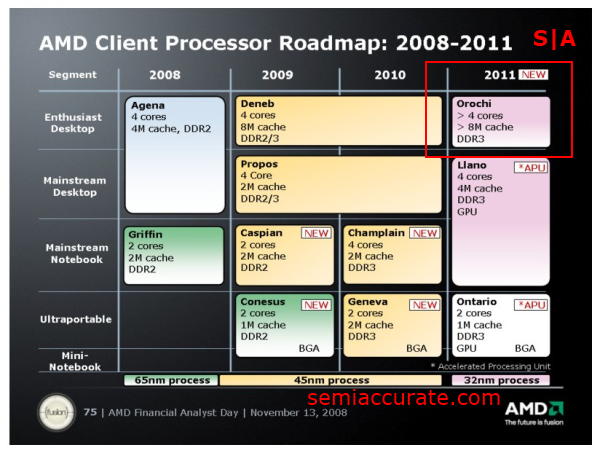 At financial analyst day 2009 AMD started to finally give us a general overview of what this new architecture would look like by introducing the module concept. The code name for the desktop part was also changed to Zambezi. After the disappointing launch of the original Phenom, Bulldozer was seen by many to be AMD’s next opportunity to seriously challenge Intel for the performance crown. And at Hot Chips 22 AMD kindly release a general overview of the new architecture. Most of the speculation around this time was based off of information from AMD’s vague roadmaps and little kernels of information slipping out from AMD. One of the best blogs on these kernels was that of S|A forum member Dresden Boy’s. When news started to spread that Global Foundries had released a die shot of bulldozer many were surprised that it hadn’t come from AMD itself. This dies shot, although openly photo shopped by AMD, was used as the basis for many speculative comparisons and die size estimates. 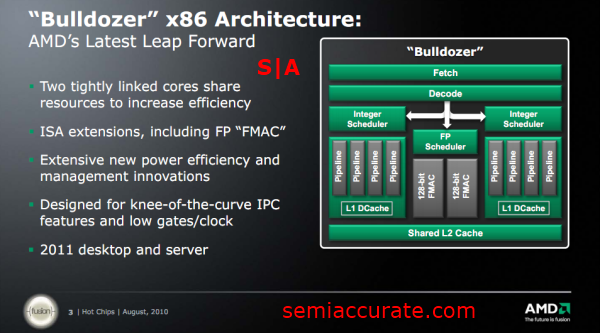 The most interesting fact to many during this period was that a Bulldozer module was about the same same as a Sandy Bridge core, or two K10.5 cores. 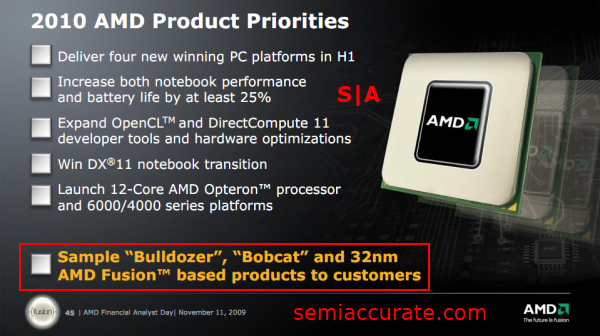 Bulldozer was confirmed to have taped out in Q2 of 2010 during AMD’s quarterly conference call. This came after S|A’s own Charlie had a little mix up with the Bulldozer and Llano tape out dates. DonanimHaber leaked the first slide that gave semi-concrete performance expectations for Zambezi. It promised a 1.5x increase over a i7 950. This slide was never confirmed to be legitimate, but still served to set expectations for FX. At the beginning of 2011 many expected the Bulldozer architecture’s desktop incarnation, Zambezi, to be launched in April or May. This was based of a bunch of slides leaked on a Swedish forum and the impending launch of AMD’s AM3+ motherboards at around the same time. Soon after a slide from an AMD presentation that took place in September of 2010 changed this expectation to June at E3. From here thing went completely off the handle. Issues with Llano and Global Foundries’ 32nm process seemed to put Bulldozer in jeopardy and no one on the outside really knew what was going on. Despite this AMD kept it’s game face on and bits of information kept cropping up. The Bulldoxer box art was leaked in mid-March and was well received. In May a slide, supposedly from ASUS, appeared that seemed to confirm some of the rumored information about these FX CPU’s and hint at specific clock speeds. S|A’s sources informed us of a delay to Bulldozers schedule in late May. Q3 was the word on the street and then something interesting happened, AMD’s priorities changed from Desktop first to Server first. That ended up being the strategy that AMD stuck to, with it’s Bulldozer based Interlagos server chips shipping to vendors last month. June brought E3, the AMD Fusion Developer Summit, and the Llano launch. 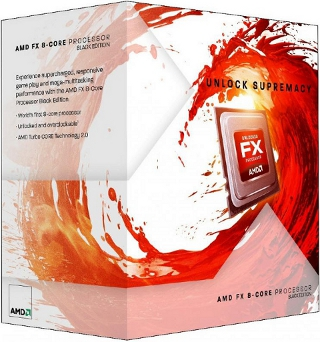 At E3 AMD officially reintroduced the FX brand for its high-end CPUs. This was a positively received move on AMD’s part. FX was the name of the high performance CPU line back in the Athlon 64 era and good things tend to flow from nostalgia. Or so they hope! At AFDS AMD was very quiet about Bulldozer, which was acceptable seeing as the event was part of the Llano launch. Luckily they Rick Bergman did offer a slide promising Zambezi with 60 to 90 days. That was a promise that he couldn’t keep though, as it’s been more than 90 days since June 2nd, and Mr. Bergman is no longer an AMD employee. Obviously, things changed. In August the final die size of Bulldozer was leaked to S|A. Coming in at 315mm2 Zambezi is considered to be a rather large chip. Reactions to this news were again mixed as it was not as small as many had hoped but still not as large as the Phenom II X6 die. In September AMD had an FX overclocking event at their headquarters. AMD’s FX took the world clock-speed record with an 8.4+Ghz run. Overclokcing seems to be one of the biggest features of AMD’s FX CPUs. Gigabyte even did an 8Ghz LN2 run yesterday to show off their motherboards. This was seen as a positive event by most, as it gave some credibility to the claims that Bulldozer would clock higher than its predecessor. Soon after a bunch of benchmarks started showing up. These benches were not pretty, they were also not representative of final silicon. 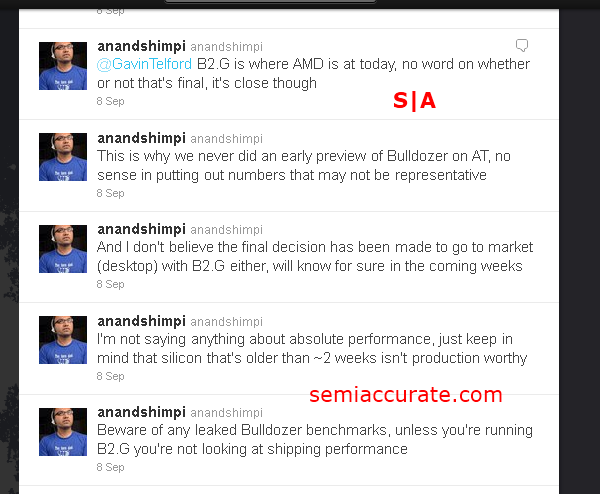 This prompted Anand Lai Shimpi to tweet that the benchmarks should be disregarded. Around this time rumors started appearing that AMD would offer water cooling on some of its high end CPU, and they seems to have come true. 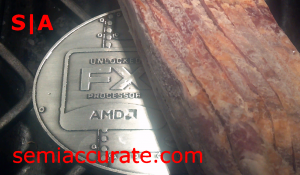 Others have shown tin boxed FX CPU’s that have come with what appear to be FX themed belt buckles. Not bad. DonanimHaber yet again leaked slides from AMD. This set was purported to the presentation for the FX launch briefing. These slides had a mixed reception with some liking the price/performance angle in them and others appearing to be severely disappointed by the benchmark numbers shown. Then Lab501 released a preview article of AMD’s FX-8150. This preview was poorly received in the community due to the low performance of FX in its benchmarks. This brings us to the present day. We’re waiting on the edge of our seats, and preparing to staying up way too late so we can read the first reviews popping up around the web. It’s been an entertaining ride, and for the record, AMD’s “official” pre-launch activities are described in this blog post. Latest supercomputer to run on InterLagos cores.